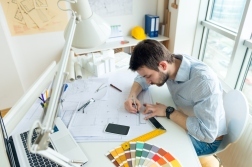 Outsourcing your accounting and bookkeeping functions to Graber & Associates makes sense for busy small business owners like architects and structural engineers. We’re a highly experienced Baltimore, MD CPA firm and business advisor that’s ready to take accounting tasks off your hands so you have more time to focus on running your business. We can handle everything from bookkeeping and tax planning to complicated items like budgets and cash flow management. You’ll have peace of mind knowing that a qualified CPA firm is overseeing your finances with the utmost attention to detail and accuracy. And, we’ll keep you informed through weekly and monthly financial reports. We offer high-quality accounting packages at rates that are economical for small businesses. Hiring an in-house accounting department takes considerable time, effort, and resources, but we’re only a phone call away. Start saving precious time and cutting costs with our affordable accounting and bookkeeping services for architects and engineering firms. Request a free initial consultation today through our website or call us at 410-466-3779. We’ll take the time to learn about you and your business with the goal of establishing a lasting professional relationship.